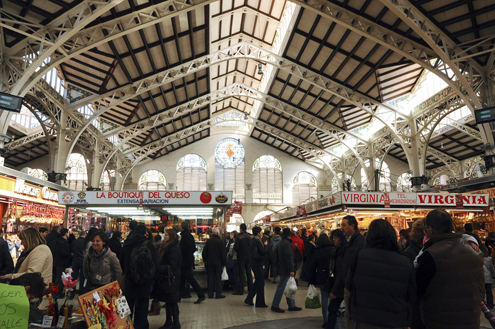 As one of the oldest food markets in Europe, Valencia’s fascinating Central Market (Mercado Central) sells a tantalizing variety—from fruits to meats to wine and baked goods. 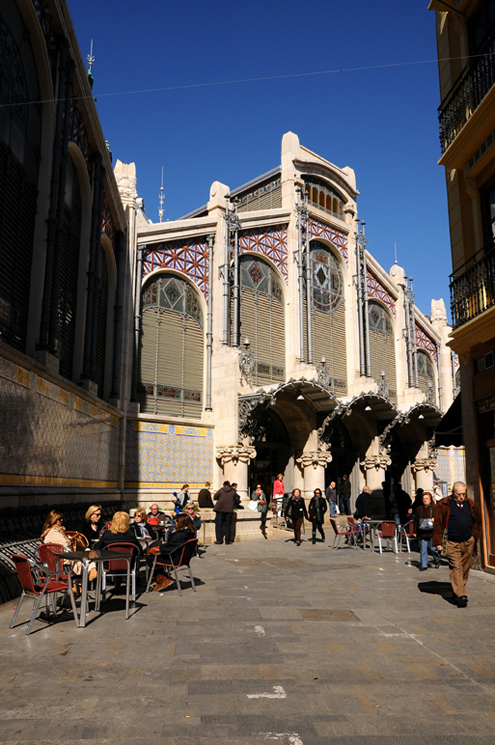 The striking building, with its domed ceilings, colorful tiles and ceramics, is worth seeing (even if food is not on your mind). 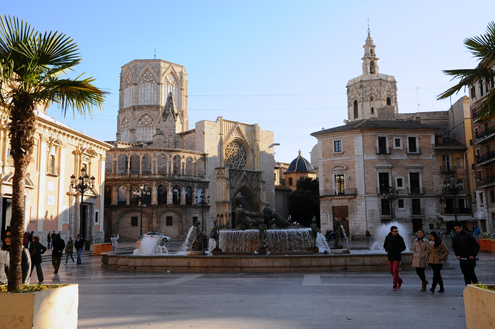 At the center of Valencia’s historic district is the bustling Virgin Square (Plaza de la Virgen), once the forum of Roman Valencia. 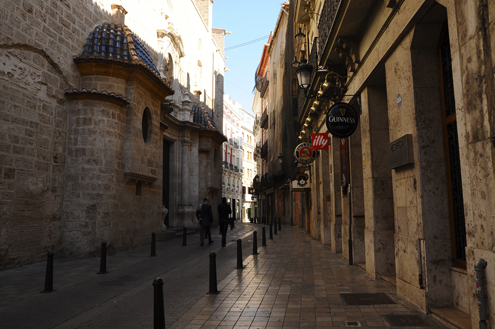 Surrounded by cafes and landmark buildings, it’s a great place to people watch. 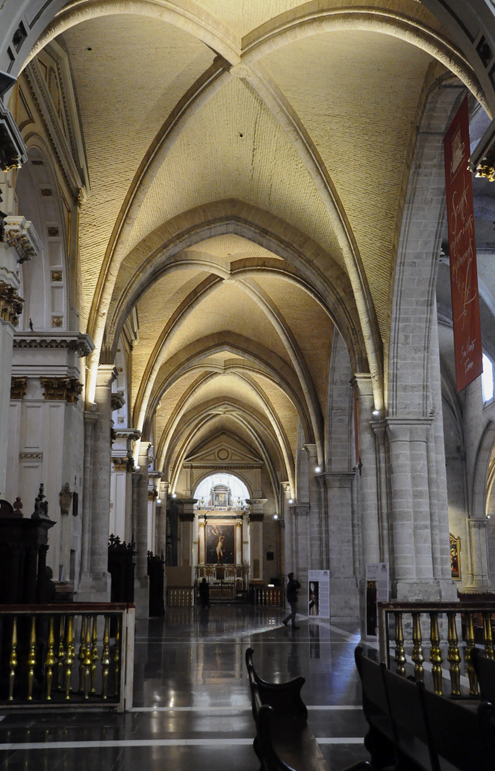 Consecrated in 1238, Valencia Cathedral (Iglesia Catedral Basilica Metropolitana de Santa Maria) is an architectural beauty. 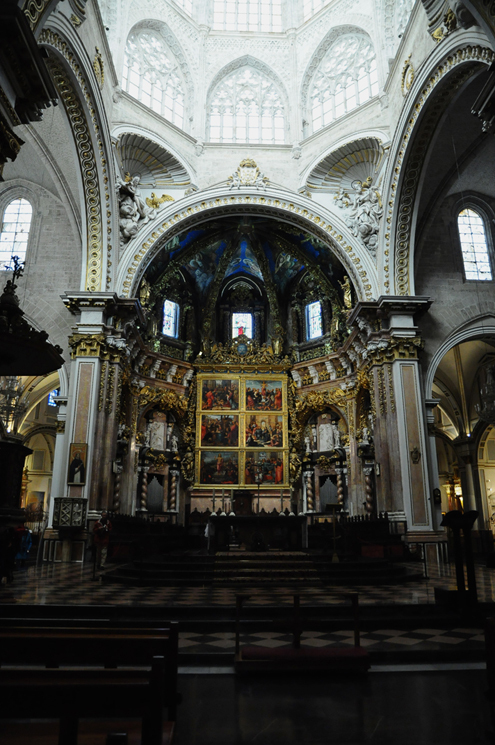 Designed primarily in the Gothic style, it also contains Romanesque, Baroque, and Neo-Classical elements. The Gothic Chapel of the Holy Chalice (Gothic Capilla del Santo Cáliz), near the main entrance, is said to hold the Holy Grail—the chalice Christ sipped from during The Last Supper. The Patriarch Museum (Museo del Patriarca), housed in the Royal College of Corpus Christi Seminary, was founded by Saint Juan de Ribera in the 16th Century. 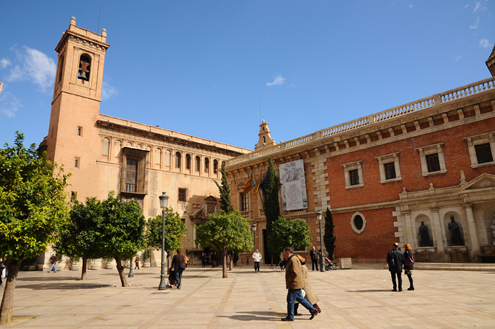 The museum contains a wonderful collection of paintings, including works from El Greco and Francisco Ribalta. 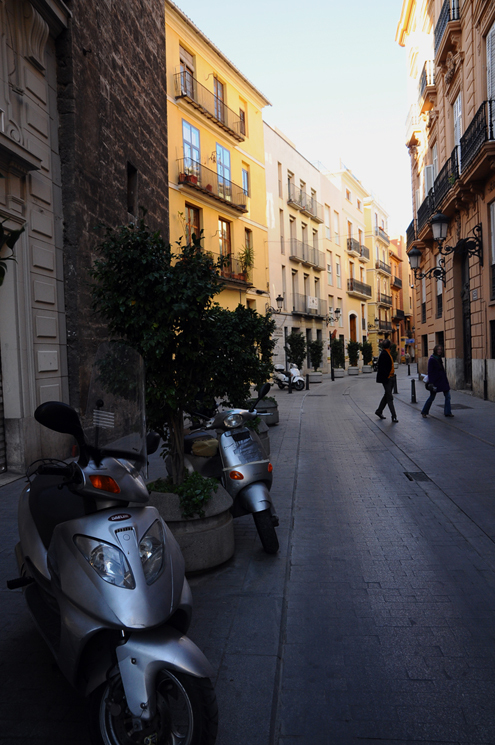 With a modern architectural complex located in a city founded in 138 BC, it’s no wonder Valencia is often described as a “city of contrasts”. 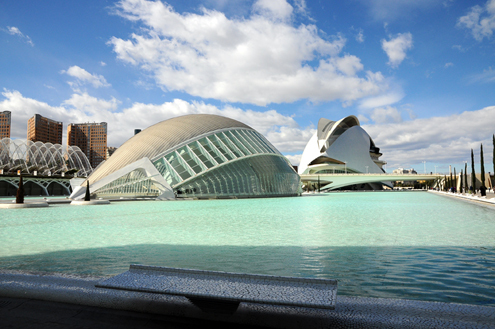 Simply striking on a bright, sunny day, the City of Arts and Sciences (Ciudad de las Artes y las Ciencias) contains several fascinating structures, including a cinema, planetarium, science museum, oceanographic park, and an opera house/performing arts center. 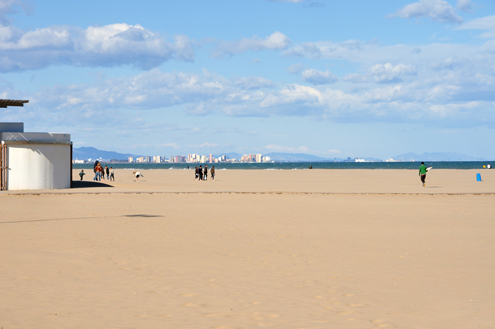 Playa de las Arenas—one of Valencia’s city beaches. Being the birthplace of paella, it wouldn’t be a proper visit to Valencia without feasting on this delicious rice dish more than once. However, in true k&mk fashion, we forgot to take a photograph. Apologies. I can assure you it was terrific. We enjoyed seafood paella (paella de mariscos) at a restaurant along Playa de las Arenas (photo above) as well as traditional Valencian paella (paella valenciana) in the city center. Muy bueno! Muchos Gracias, Valencia! We had a great time. 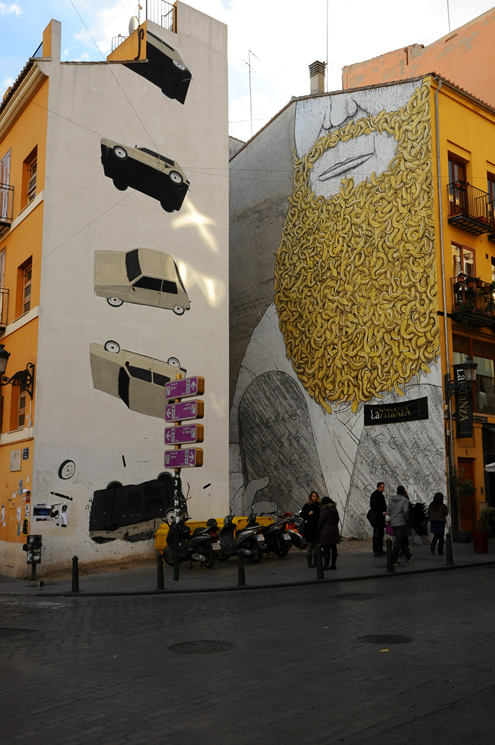 This entry was posted in Spain and tagged photography, Spain, travel, Valencia. Bookmark the permalink.